A total of 19 bowlers took part in the junior section, and the competition is comprised of two elements. Firstly, there are singles in which each player competes against three other members in seven end matches using three bowls, with 10 points on offer for each win and five points for a draw. Secondly, the bowlers then undertake a series of skills in which a scale of points is awarded and these include jack casting, beating the shot bowl, drawing to the centre line and controlled weight. After all the singles matches were played, the lead was being shared by five players: Gracieana Milgate, Erin Trip, Freddie Trew, Joe Oram and Manderson, all of whom scored maximum points with three wins from three matches. They all carried those 30 points into the afternoon’s skills, and leading the way in those skills with 51 points claimed was Manderson, with Lunn second on 42 points and Trip third with 39 points. When the two sets of points were added together, the overall winner was Manderson with a very high total of 81 points. In second was Erin Trip of Desborough with 67 points and in third was Alex Trip of Desborough with 59 points. 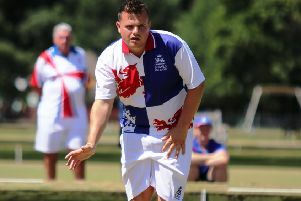 There were 13 players in the senior section, and after the singles, the lead was being shared by just two players, Shannon Swift and Tay O’Neill, with a 100 per cent record of three wins from three matches. Leading the way in the skills section was Lois Woodward with 61 points, followed by Emma Muir with 52 points Swift and O’Neill, with 46 each. When the singles points were added to the skills, it was a very close-run result with the overall winner being O’Neill of Desborough with a total of 76 points. He just edged out Swift of Northampton & District IBA into second place by virtue of a better shots aggregate, as she also had 76 points, and in third was Woodward of Desborough with 71 points. The top two players in each section have now qualified for the Midlands Region Final to be held at Melton & District IBC on April 8. NORTHANTS Men IBA travelled to Brackley & District BC for a friendly three-rink match and claimed a 68-49 win. John Haines’ rink, which posted a 29 shots victory, the County won the match by 19 shots. THE following players have been selected for Northants Men’s friendly against Warwickshire IBA next Wednesday (Feb 14) at Kingsthorpe BC (2pm). LATEST results from national comepetitions. Men’s under-25 singles last 16 (played in sets): David Walker, Kingsthorpe BC lost to Jordan Moody, Five Rivers IBC, Salisbury 2-0. KINGSTHORPE returned to winning ways in the Wessex League as they hammered Nomads 120-48. The Northampton side claimed the maximum 16 points and the win keeps Kingsthorpe in second spot on 94 points from their seven matches. They have two to left to play, behind Church Gresley IBC with 115 points, who have one match left to play. DAVENTRY played Welford-on-Avon in the Wessex League and were well beaten 110-62. All four rinks played at Welford, with Daventry claiming just one point.